Tradeshow Follow Up - 4 Imperatives for Success. A Must Read! The close of a tradeshow doesn't mean the work is over. In fact, it is where some of the most important work begins. Focused, aggressive follow up is how sales are made, but follow up is where many exhibitors fall short. Significant effort goes into planning, booth design, staff training and promotion, as well as working the show. By the event ends, your staff has talked with hundreds of people and collected valuable leads. Capitalize on these efforts with these four tradeshow follow up rules. As you know, not all leads from shows are created equal. Prioritize them, based on predicted buying potential. "Hot" leads need immediate contact – within two business days. And a call is more effective than sending an email, text, or mailing. 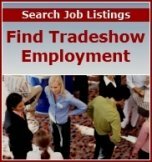 Research indicates that the majority of leads garnered from trade shows never receive follow-up by company representatives. This wastes money and the investment in time you spend. The timing to reach out to people and companies who express interest is critical. And, the window of timing is narrow. Don't let a hot prospect become a cold lead because too much time has passed before you've made contact. Of course, not all leads you receive will be interested in buying your product or service. This doesn’t mean that warm or even cold leads should be ignored. Focus on a follow-up strategy that builds two-way communications with these individuals. This will enable you to gain a greater understanding of their business needs and, over time, serve as resource to them. As an example, for leads that you deem "warm" and indicate some level of interest in your offerings, send a follow-up letter or email with additional information. Thank them for coming by your display booth and reinforce your sales message. Request a phone call or meeting to enable them to get to know you and your company, as well as enable you to gain a better understanding of their needs. Also, add them to your email newsletters and/or social media distribution lists. Invite them to participate in webcasts, or regularly send them helpful articles or links to key information about your industry. The goal is to cultivate these potential buyers, offer information of value to them, and keep them actively involved with you until they are ready to purchase. One of the most important post show activities is to evaluate your performance to help you plan future events. "Trade shows are experimental marketing," says Barry Siskind, author of Powerful Exhibit Marketing. That's why it’s important to find out what went wrong and what went right. Therefore, ask your staff the following questions. Was it the right trade show for your company? Was the exhibit fully functional and did it match the venue? Was your exhibit in the right location to attract enough traffic? Did you meet the right people or prospects? Were your literature and handouts effective? Was your sales force able to handle the booth traffic and meet prospects? What did the competition at the show do differently? How did they fare compared to your efforts? In all tradeshow follow up activities, don't assume that potential customers will take the time to contact you for more information. In fact, they won't Remember that your hot leads also talked to your competition at the same show – and they will most likely respond to whoever does the best follow-up. Information for this article on tradeshow follow up by Mimi Hashemi of Tart Marketing.